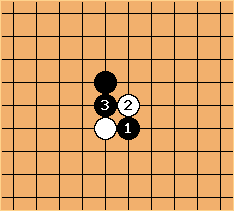 Against the hane there are three basic techniques: the cross-cut at a, the counter-hane at b and stretching at c. These choices are influenced by surrounding stones. 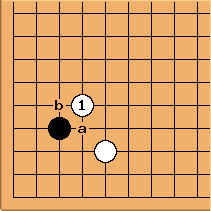 If the contact play is not supported, then it was probably played in Black's sphere of influence, in order to extract something. Cross-cutting creates four groups on the board and it becomes increasingly difficult to capture or save everything. White's intention to get something is well served by the cross-cut. White's play is light and he must have a strategic reason for that. 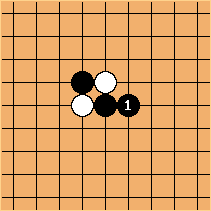 A counter-hane also leaves the option for Black to cut at a. 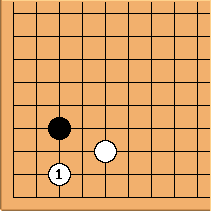 Black has many options to follow up, one of these being a connection at b. The fact that this connection is possible, makes it a little more difficult for White to ''get something'': the connection says "all or nothing". So, this move, while being full of flexibility, is a little heavier than the cross-cut. The stretch at is mostly seen when the intial contact play is supported. 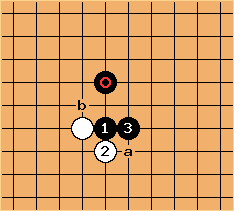 The move creates a simple connection, which immediately reduces to 3 liberties. The two stones are weak and no part of it can be sacrificed. White's play is heavy. This is why we see it mostly with support and not in Black's sphere of influence. 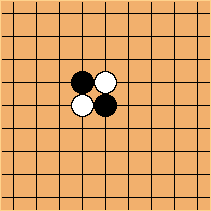 Black is called Hane at the Head of Two Stones and is considered locally very bad for White. After , which was so good that it was imperative, Black has two local answers, if there is no support. Leaving it, maybe oddly so, is also an option. It's worth going into this. If we compare "doing nothing after a hane" and "doing nothing after a stretch" (after an initial contact play), we see that the stone is more easily captured after a hane. Moreover, capturing the stone after a stretch leaves the marked stone without function: the four other stones have captured an enemy and hence connected themselves. So, the marked stone connects connected stones. That's very inefficient: we would prefer to have used it for something else. That's why, the hane creates an urgent position, but the stretch not that much: the White stone is light in the latter case. Stretching and staying ahead of White's development, is a possible answer. Jumping away to is a more advanced techique. The structure is lighter, but due to a good follow-up for Black, also quite urgent. The knight's press is actually a supported diagonal check. 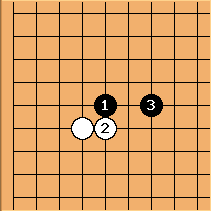 Just like the contact play, the diagonal check is bad in itself, but when supported by other stones it can be locally good. Black's answer a would result in a loss of liberties for Black, so he will reply at b, because, like a it stretches against the diagonal check which is the only local move. The main purpose of is to block the development of the Black stone to that direction. When done from center to side, this is called to press. 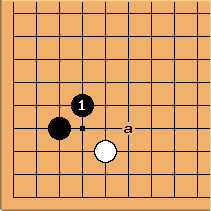 After - , White's connection is strengthened and Black has not increased his liberties. 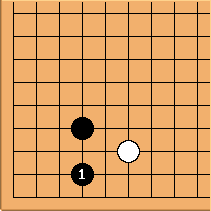 There would only be a purpose in if followed-up by a cut at a, but then White will further reduce the liberties of the Black stones, while completely enclosing them. In unsupported environment, this is hardly affordable. So Black answers at here and White increases her liberties as shown before, by answering the stretch with another stretch. undermines the base of the black stone, creating a base for the friendly stone. Without the context of the bottom line, this move is a matter of mutual development. The attachment is typically a move in hostile environment. White seeks quick settlement, not necessarily saving all her stones. Black can prevent the above pressing manoeuver, by playing a diagonal move. 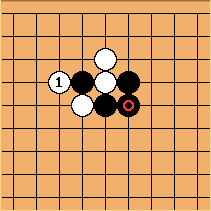 Black now aims himself at pressing White down at a. This shows a fundamental relationship between the diagonal and the knight's move. Black's one space descent? prevents being undermined like in the second diagram. Without the context of the edge it is a matter of mutual development. 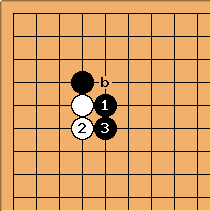 The stretch prevents White making sabaki by attachment. A cross-cut in isolation is unlikely to occur: the position is so urgent that the player creating it puts himself at a disadvantage by giving the initiative to the other player. It is more likely for a cross-cut to appear with supporting stones. However, for clarity of later discussion, the isolated position is worth discussing. There are four groups here (one stone each) and each group has two liberties left. If one of the groups is captured, the capturing player connects all his stones. The remaining stones are all scattered against a strong position and the result is extremely unbalanced. The question is: do you try to capture one of the enemy stones, or do you defend one of your own. The other choice for Black is to atari at . 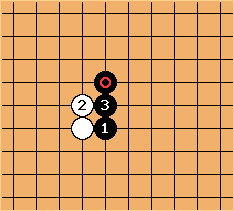 In this extremely urgent position, where capture takes control of the whole area, White must save her stone under atari, or the whole exchange would have been pointless. 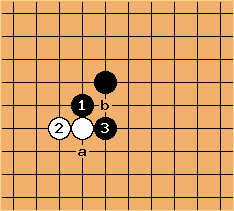 After the exchange, Black has three groups with 2 or 3 liberties. It is difficult to take care of all three. The most logical choice is next to connect at a. Doing all of this instead of simply extending is inspired by the surrounding position. After Black's connection, captures the cutting stone in a ladder. A ladder is a special technique where the cutting stone cannot be saved, because every time the liberties are raised to 2, the opponent reduces them to 1, and the whole sequence leads to the edge, where it is impossible to increase liberties. Capturing a stone in a ladder always results from a cross-cut situation. Capturing a stone which does not cut, is not urgent. spans a net around the cutting stone of her two groups. A net is a special technique, where the cutting stone can not be saved. The net move itself does not reduce any liberties, but as soon as the cutting stone sets itself in motion, the next move(s) will reduce its liberties in a fatal way. 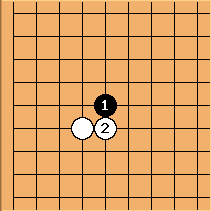 When two stones are in an opposing knight's formation, both can play a diagonal attachment. is a contact play or attachment, but it is diagonally linked to the initial stone. Both the contact play and the diagonal are not the strongest possible moves in themselves, but combined they form an awkward move. As with the contact play in isolation, this is a very urgent position. White's basic answer is , making a simple connection, which is the strongest shape and very appropriate in close combat. The - exchange results in conflicting diagonal and straight development, and we know from a previous section that the straight development has the advantage. So, although Black had the initiative and kept it, he reached an inferior result than the initial situation. Then why would anyone play the diagonal attachment? Therefore we have to look at the drawbacks of the simple connection: its lack of speed and flexibility. If in danger, it cannot hasten out of the danger zone and it has to be saved as a whole. In other words, a diagonal attachment makes the enemy heavy and can be seen as a preparatory move for attack. it starts forming eyeshape at b. The move is also efficiënt in this context: the number of stones used is 3 to 2. 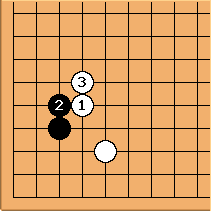 Black will take full control of the area, by reducing the white stone to 2 liberties. Of course, Black has invested 2 stones more and the position is not as efficiënt as a simple wrapping combination of and . We may start from the assumption though that the knight's opposition indicated that the area is important, so yielding control as White does here, must be induced by strategic considerations. 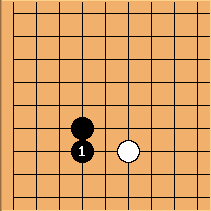 White's wrapping move (hane) at is the basic answer: it is the basic answer against a contact play in isolation. 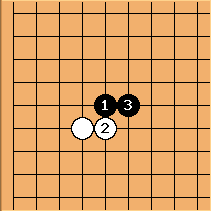 This choice of hane stays away from the marked stone, while weakening the contact play of . 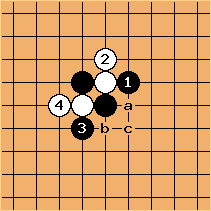 After White's wrapping move, an isolated has the choice of counter-hane at two sides, or cross-cut. However, here we must already take another stone into consideration: the marked one. 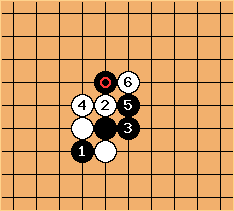 The connectivity, the eyeshape and the efficiency of Black's stones are at stake. Wrapping around here is risky: it tries to split a one space jump. immediately is reduced to 2 liberties. Black has a choice between two atari: a and b. This aggressive move of is also induced by strategic considerations. Stretching inward, while frustrating the tiger's mouth, with provokes the ideal move of , combining its own firm connection of three stones with a reduction of White's liberties. 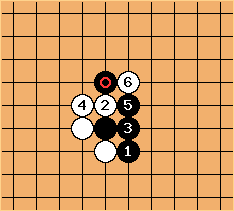 Any other move, such as stretching outward leads to Black getting a tiger's mouth, which is considered advantageous for reasons outlined before. After White's basic answer at , Black's basic answer is . 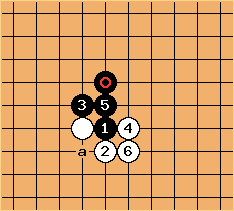 When - is played in isolation, is an inferior choice, because next White will wrap around two stones at a. However, due to the presence of , Black would then create a tiger's mouth at b which is good. Let's see why other options for are inferior when is present. If counter-hane, plays atari and Black has four stones with five liberties. 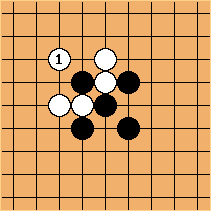 Assuming White plays next, she has 6 liberties for her three stones. Indeed she has a cutting point, but let's look at what the stones accomplish, besides connecting to each other. Both structures develop towards two sides and block each other's development towards those. But there's something wrong with . 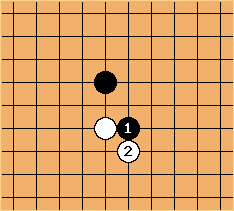 If it weren't there, Black's group would have the same amount of liberties, the same connectivity and almost the same scope for development. In other words, is a wasted stone. Black's structure - - is called an empty triangle. It is very inefficient. If Black applies his basic move in isolation the other way, as here, White can create complexity by playing atari at , trying to cut apart Black's intial supported contact play. If we assume that was an important stone, the choice of having it cut off must be inspired by strategic considerations. A cross-cut always creates complexity. 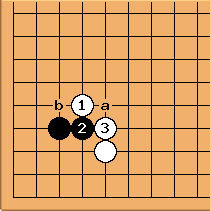 Here, Black has to take his initial stone into account. As in the previous diagram, if we assume that was an important stone, the choice of having it cut off must be inspired by strategic considerations. 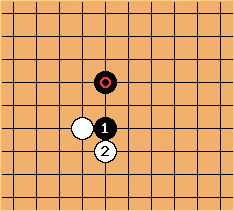 In this diagram the two stones are one space apart, resulting from a one space approach by either player. 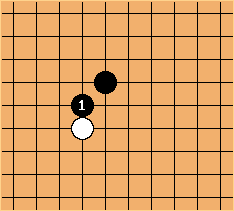 One player, say Black, can now attach to the opposing stone, by making a knight's move. The knight's move is weaker than the one space jump, so the support for the contact play here is weaker than in the contact play supported by a one space jump. 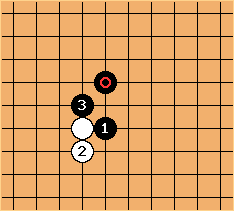 Again, White's basic answer is guided by her basic answer to the contact play in isolation, the hane. The basic answer in this situation is to wrap around Black's attachment, while staying away from his support. Here, turns into Black's formation. Black naturally cuts. There are four groups in a cross-cut and Black has one group having twice as much liberties as the other. 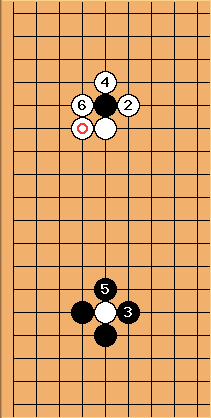 This extension from a cross-cut is a basic structure, which is advantageous for Black, if no other stones are supporting the area.